Kraft Paper is produced by Kraft (chemical) pulp, has high toughness handling capacity and printability. Kraft Paper is widely used in the packaging industry, by converting it into bags, pouches, wrapping papers, cans, cartons, corrugated sheets including others. Kraft pulp, which is used for the manufacturing of Kraft Paper, is comparatively darker than other than other wood pulps. Kraft Paper can be bleached to improve its brightness and is also used for the purpose of handling heavy duty items. Kraft pulping technology has better performance than other pulping technologies which implies its usage, it is employed in approximately 80% of the total paper production. Kraft Paper is available with different characteristics across the world which includes sack Kraft Paper and specialty Kraft Paper. The demand for customization is increasing due to growing consumer bargaining power and improving technical specification qualities. Specialty Kraft Paper basically includes two types of paper: machine glazed and machine finished Kraft Paper. Machine glazed papers are used for packaging of end use based products, which has high consumer appeal. Machine glazed paper applications ranges from consumer goods to fat-resistant papers, fast food markets, barrier paper for butter & other dairy packaging among others. The Global Kraft Paper market is segmented as per basis weight, product type, grade type, finish type, application and end use. There are a variety of Kraft Papers available in wide range of basis weight, which basically tells about the density of Kraft Paper. Thickness of Kraft Paper affects its applications, and usually increment in its thickness improves its quality. Sack & specialty Kraft Papers are available in different thickness options & finishing type, which enhances their performance capabilities. Kraft Paper can be used without bleaching or it can be bleached to improve its dullness. Bleached Kraft Paper has less effect of Ultra-violet rays on its brightness and breaking length. Bleached Kraft Paper also has better properties as compared to unbleached Kraft Paper. Unbleached Kraft Paper is used for industrial purpose or to handle large and bulky items. The demand for bleached Kraft Paper is driving the global Kraft Paper market. Kraft Paper usage is witnessing improvement in statistics due to increasing use of packaging paper. Kraft Paper is also classified on the basis of finish type which includes glazed and finished type. Finished type of Kraft Papers are used where smoothness of paper is a key concern, and scores high in terms of toughness. Kraft Paper application include bags & pouches, corrugated sheets, cartons, sacks, envelopes, and composite cans. The usage of bags and pouches is increasing due to consumer demands and need for convenient packaging. Sacks are widely used in manufacturing facilities and industries, which produces powdered materials and other fertilizers. Kraft Paper is used in making corrugated boxes and other corrugated materials by making two layers of Kraft Paper on a corrugated material. Corrugated sheets are used for making folding cartons, boxes, rolls and other packaging solutions. Composite cans have variety of product types available, based on its production technique, closure type, can diameter and its uses. Composite cans are often replaced by Wrapping paper bags and other pouches, but have number of applications in other industries than food & beverages. Softwood fibers used for Kraft pulping process, which provides high folding strength and has better printability than hardwood pulp which are comparatively shorter. Softwood Pulp used for Kraft Paper manufacturing is excellent material for printing paper, Kraft Papers, text papers, offset papers. The manufacturing process of Kraft Paper has better recovery of waste released from the Kraft pulping process. Kraft Paper can be manufactured by recovered papers which can be magazines, newspapers, office papers, and other packaging paper exclusive of paper used in food applications. Almost of all the paper & paperboard production, more than half is covered by packaging paper, which includes packaging paper. Kraft Paper used for medical purpose are made from long softwood fibers which gives wet strength, tensile strength and required flexibility to the paper. While shorter softwood fibers affects the formation of Kraft Paper and its pore size. Companies invests in Employee research groups and other research and developments so as to have innovative solutions which enhances the quality and performance of packaging products. 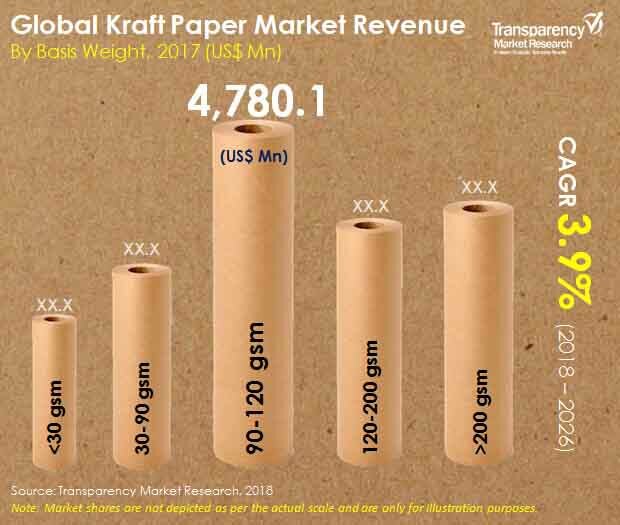 This Transparency Market Research report studies the global Kraft paper Market for the period 2018–2026. The prime objective of this report (Kraft paper Market) is to offer insights and key market trends pertaining to Kraft paper Market that are gradually helping transform global businesses. The global Kraft paper Market report begins with the executive summary for various categories and their share in the Kraft paper Market. It is followed by market dynamics and overview of the global Kraft paper Market, which includes TMR analysis of market drivers, restraints, opportunity analysis and trends that are affecting growth of the Kraft paper Market. Furthermore, to understand the popularity of the Kraft paper segment, the attractiveness index and BPS analysis with elaborated insights on the same is provided, which will show the market’s attractiveness based on factors such as CAGR and incremental opportunity. To show the performance of Kraft paper Market in each country and region, BPS and Y-o-Y growth analysis is provided. The global market for Kraft paper is further segmented as per basis weight, product type, grade type, finish type, application and end use. On the basis of basis weight, global market for Kraft paper is segmented into less than 30gsm, 30-90 gsm, 90-120 gsm, 120-200 gsm, and above. On the basis of product type, global market for Kraft paper is segmented into specialty and sack Kraft paper. On the basis of grade type, the global Kraft paper market is segmented into bleached and unbleached kraft paper. On the basis of finish type global kraft paper market is segmented into glazed and finished kraft paper. On the basis of application, the global kraft paper market is segmented into bags & pouches, sacks, envelopes, corrugated sheets, composite cans, and cartons. On the basis of end use, the global market for Kraft paper is segmented into food & beverage, pharmaceuticals, building & construction, cosmetics & personal care, electronics & electrical, and other consumer goods. A detail analysis of wrapping paper trade has been provided in the report, of which, Kraft Paper accounts for a significant share. The section is intended to illustrate the consumption, export, import, and production scenario of wrapping paper, by key countries. The next section of the report highlights the Kraft paper Market, by region, and provides the market outlook for 2018–2026. The study investigates the Y-o-Y growth regionally, as well as analyses the drivers that influence the regional Kraft paper Market. Main regions assessed in this report include North America, Latin America, Europe, Asia Pacific, and Middle East & Africa (MEA). The report (Global Kraft paper Market) evaluates the present scenario and growth prospects of the regional Kraft paper Market for 2018–2026. To ascertain the market size in terms of value and volume, revenue generated by the key manufacturers and their respective production capacity is taken into consideration. The forecast presented here assesses the total revenue generated by value, across the Kraft paper Market. In order to provide an accurate forecast, we initiated by sizing up the current market, which forms the basis on how the Kraft paper Market is expected to develop in the future. Weighted average pricing of Kraft paper has been calculated on the basis of basis weight. Given the characteristics of the market, we triangulated the outcome on the basis of three different types of analysis; based on supply side, downstream industry demand and the economic envelope. In addition, it is imperative to note that in an ever-fluctuating global economy, we not only conduct forecasts in terms of CAGR, but also analyse the market based on key parameters, such as year-on-year (Y-o-Y) growth rates, to understand the predictability of the Kraft paper Market and identify the right opportunities across the market. The market segment for global Kraft paper Market have been analysed in terms of basis point share (BPS) to understand the individual segment’s relative contributions to market growth. This detailed level of information is important for identifying various key trends in the Kraft paper Market. Another key feature of global Kraft paper Market is the analysis of key segments in terms of absolute dollar opportunity. Absolute dollar opportunity is critical for evaluating the scope of opportunity that a provider can look to achieve, as well as to identify potential resources from a delivery perspective of the Kraft paper Market. The overall absolute dollar opportunity along with the segmental split is mentioned in global Kraft paper Market. To understand key growth segments in terms of growth and adoption for Kraft paper Market. Globally, Transparency Market Research developed the Kraft paper Market ‘Attractiveness Index.’ The resulting index should help providers identify real market opportunities. In the final section of the report on Kraft paper Market, the ‘dashboard view’ of the companies is provided, to compare the current industrial scenario and their contribution in total Kraft paper Market. Moreover, it is primarily designed to provide clients with an objective and detailed comparative assessment of key providers specific to a market segment. Report audiences can gain segment-specific manufacturer insights to identify and evaluate key competitors based on the in-depth assessment of their capabilities and success in the Kraft paper Marketplace.